Norway is full of it. If you say you are going to do something, no one follows up on it because you said you would do it and your word is good enough. When a pedestrian approaches a crosswalk, they don't stop and look both ways before stepping out into traffic. The law says that cars stop for pedestrians at crosswalks and so it's generally just trusted that they will do just that. When I went to the optician's office to pick up contact solution the clerk asked if I was a client there because that would entitle me to a discount. I told her, 'Yes,' but she didn't ask for my name or any sort of assurance; I was awarded the discount because she trusted what I said. Rules are rules and people will follow them and that is how things run here. It works here because Norwegians are generally pretty trustworthy. If they weren't, I'm sure society wouldn't put so much faith in the value. But, unfortunately, there will always be those who prey on this inherent sense of trust. 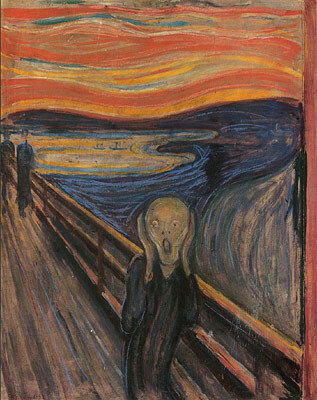 Edvard Munch's 'The Scream' is easily Norway's most recognizable contribution to the Art world. In fact, there were actually four versions made with one selling in 2012 for a cool $120 million USD. The other three are housed in Oslo in the National Gallery and the Munch Museum. On a quiet Sunday morning in the late summer of 2004, two masked men walked into Oslo's Munch Museum where they lifted one of the prized Screams off the wall (in addition to another work titled Madonna) and ran out to an escape car waiting on the street. Museum goers watched in shock as the famous work of art disappeared. Interestingly enough, this wasn't the first time a 'Scream' was stolen. In 1994, two men climbed a ladder, broke a window and entered Norway's National Gallery in Oslo snatching another version Munch's prized art works. Norway faced a lot of criticism about their lack of security yet despite the previous robberies, not many changes were made. It was argued that the famous paintings were practically impossible to sell due to their international fame and thus, the expense of providing tight security was decided to be unnecessary. After the 2004 robbery, the biggest surveillance operation in Norwegian history was underway and 2 years later, the stolen works of art were finally remanded albeit slightly damaged. The repairs spanned 2 years and although some of the damage was irreversible, 'The Scream' reclaimed it's spot in the Munch museum. These days, metal detectors, elaborate surveillance systems are in place and 'The Scream' sits within a heavy glass box. While Norway remains a pretty trustworthy country, it appears they've learned that precautions must be taken when it comes to Edvard Munch and his world renowned works of art. Love this post Jay - especially when it comes to describing Norwegian trust. Aspects we do not always think about first as an expat but it makes up a huge part of daily life. Funnily enough - I don't think there is much trust at all among the Brussels population... and we had the $50 million diamond heist last year. Ah yes, I remember that diamond heist. It sounded like it was something out of a movie! that's so interesting! I'm used to all these security measures to enter museums, I can't even imagine being able to just stroll right in and steal a painting off the wall. and the museum-goers didn't try to stop them or anything? I was just talking about this story yesterday! An interesting tale but so random that you would post this the very next day! That is so random, Jess! I couldn't find the nationality of the thieves - it would be an interesting commentary on the trust thing if they weren't Norwegian, you know? I wonder what the crime rate is in Norway and what the most common crimes are... because that's what crime is, isn't it? It's betraying the community's trust! This fascinates me for two reasons - I didn't realize that Norway placed such importance on trusting each other. That reminds me of the small towns in the US where I grew up. I guess it helps that most people knew everyone else in these towns, but even the strangers and newcomers were treated that way - you just assumed they'd do you right. Secondly - I can't figure out why you'd steal art. How could you ever sell anything that famous? And if you put it in your home and invited anyone else over, they'd turn you into the police. What's the point? Either way, I'm glad it was eventually recovered. The UK is the polar opposite when it comes to trust. It takes a long time to earn someone's trust here and after seven years of living here, reading the news and seeing what goes on, I can understand why. In Australia it was probably a middle ground when I lived there, but it's getting worse now. I agree with Jade, well at least where London is concerned it basically the opposite of Norway. I'd assume a similar experience in your neck of the woods of Canada but I'd say at home there was a good level of trust in people. In terms of the 'scream' I wonder how much this contributed to its popularity. I remember reading that the Mona Lisa only really became popular once she was stolen. That's a good question - I'm not sure what it's done to it's popularity! Small town SK was always a pretty trusting place but that's also because you knew everyone - if you did lie, it was pretty hard to hide from it!